“For 11 years, I’ve wanted to go to MIT,” says Ahaan Rungta, now a 16-year-old freshman, who did math puzzles at age 3, calculus at 7, quantum mechanics at 13. Born in Calcutta, at two he moved to Fort Lauderdale, where growing up he longed for “like-minded people,” so when he was 13, the family packed up and moved to Cambridge. 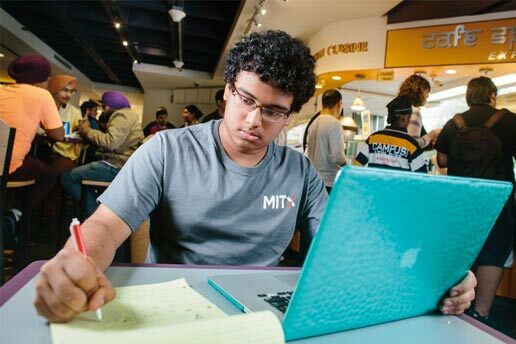 Every day since, he has visited MIT, often stopping at Café Spice, the Indian restaurant inside MIT’s Student Center that his dad manages, where he loves to sit solving problems. Every hour or so his dad stops by to say hello.